By right, this remix album is the best to play in Water festival. Though 2011 water festival was over, it is still good to have for next year water festival or other festive events. I hope you all will have fun to listen Arakanese Remix songs. You can listen by clicking the play button on the below links, and you can even download those songs by clicking the song title in front. When is the right time to go back? That's a question keep on asking me from deep inside my heart. I knew that a lot of my friends who were working in abroad also asking themselves this same questions. 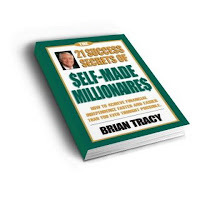 Some got their answer and get through their desired ways and successfully flew back over to home land and establish their dream business and enjoyed their life already. Some people, like me, still finding the answer and not yet get the solution that can satisfy own-selves, are still struggling in high pressured work environment. Two days ago, I had an informal discussion with one of the cab drivers while I took his cab from my project site to back to the office headquarter. Like usual drivers I'd experienced before, he asked me same question, how about your country? He quoted that Myanmar is the most richest country in natural resources in south east Asia countries, and if there were proper management for those resources, Myanmar can take top role in a short period of time in regional ranking especially in ASEAN. I agreed with him, and I also added to his comment saying that present situation was now heading to that destination we had wishes for previous generations, and if keep on going ahead with this manner, we can says that golden days of Myanmar is not too far in the future. After adding comments on his quote, I added again saying that this is the right time to go back to Myanmar for Myanmar professionals who were in abroad. And I told him that I also decided to go back and start own business within two years time. Cabbie laughed at me suddenly, and told me that he don't believe my statement. I asked him "Why?". He had answer ready for my question. He said that nearly thirty years ago, some of his friends from India also saying the same thing. His friends told him in 1981, "My longest stay in Singapore will be 10 years only, then I will go back to India. ", cabbie continued his sentence with smile, "now is 2011, twenty years from the time they told me that they will be going back to their homeland. However, they were still remain in Singapore. They came and work as ordinary worker holding work pass, a few years later they applied Permanent residence, then a few more years later, some of them even converted into Singapore Citizen. Where is their quote that they will be going back homeland?" So, how about ours? If we are walking the same road, at the end of the day, we will be at the same destiny that those people being here since long time ago. It is sure that we will be at same situation and having no choice than staying in abroad for whole rest of life. Then, what should we do? We have to walk differently from those of older generations did before. Like those others, I am also still finding the most suitable answer for my future destiny to be able to satisfy myself. How about yours, my friend? It is not compulsory to answer it over here. However, It will be appreciated if you all can share your point of views over here. Thinking with more heads is sure better than thinking with one head. 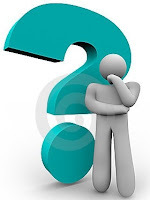 I would be pleased if I can give you a piece of thought that needed to be pondered, hoping you all get the correct and suitable answer for your lives. This is belated survey that is scheduled to be happened on last week of March. But, it still OK to do that. For those who doesn't have experienced this survey before, you can refer back first and second survey which had done before. This is third time. This time round, the most significant changes on the market is Inle had expended her business and opened one more outlet in the basement of Peninsula Plaza. Free Gift of iPhone Pouches!! Here is the survey below. This time round, we would like to pay back something to the friends who fill in their opinion. That is, we are going to give you back Soft iPhone pouches as a gift. To be able to get this free gift, first thing first, you must be residing in Singapore, and you have to fill in your opinion,at the end of survey, you will need to fill in your contact email address. After survey was closed for entry, we will be selecting ten winner randomly. We will be giving away 10 numbers of iPhone soft pouches. If you are a winner for free gift, we will be contacting you with . Then, we will give you out iphone soft pouches. Survey will be opened for participating till 30th April 2011, and result will be revealed of on first week of May. Have fun and win free gifts by filling in your opinions. As usual like last two years, this is the third annual gathering of the fellows of Pyay GTI. May Day of this year, we all will be having gathering party at East Coast Beach of Singapore. The event will be starting by 11:00 am of May Day. You can get there by either of public transport or taking a cab. 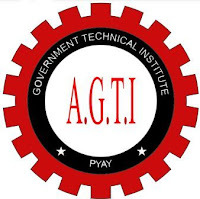 For details, please visit at our website, http://pyaygti.net and for members, please update your RSVP over this link. 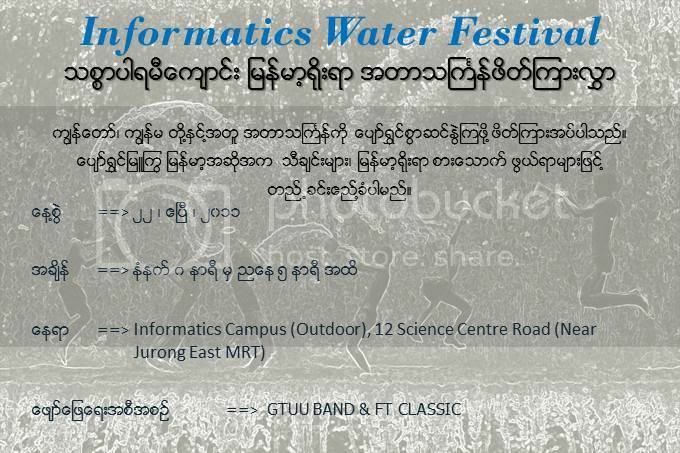 From this point, I would like to invite all of the fellows of Pyay GTI to attend this annual event. 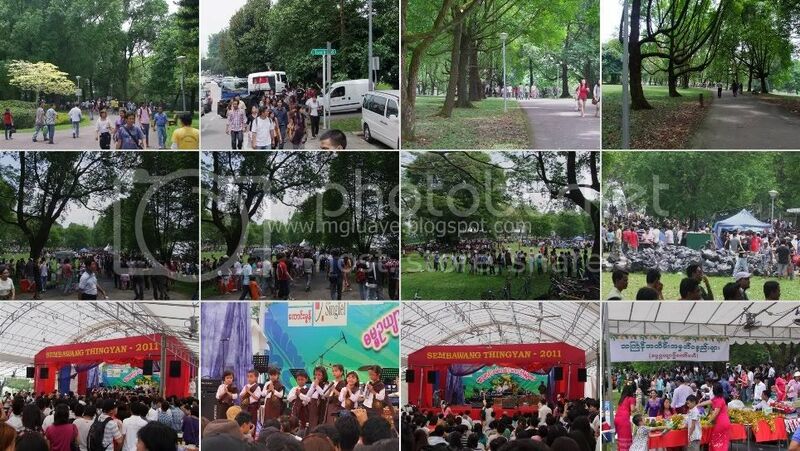 Last week Sunday, Myanmar people in Singapore were celebrating Myanmar New Year festival. I hope you would be there participating the events. I also have been there in Toa Payoh monastery in the morning and afternoon I went to Sembawang Thingyan. 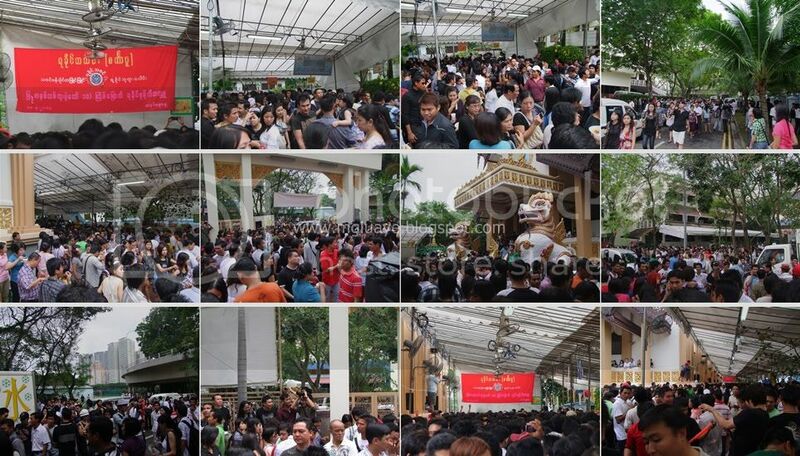 I thought that there would be about at least five thousand people came and celebrating there. The event was successful; the only thing that a bit discomfort to the participants was the transportation. The normal passenger bus was too congested and had to wait for long queue at Sembawang interchange. The taxi stand outside Sun Plaza also crowded. However, our people possessed extreme patience that can stand to be able for participation such event happened once in a year. Have you missed out those events last week? Don’t worry. There are a few upcoming New Year Events in Singapore. 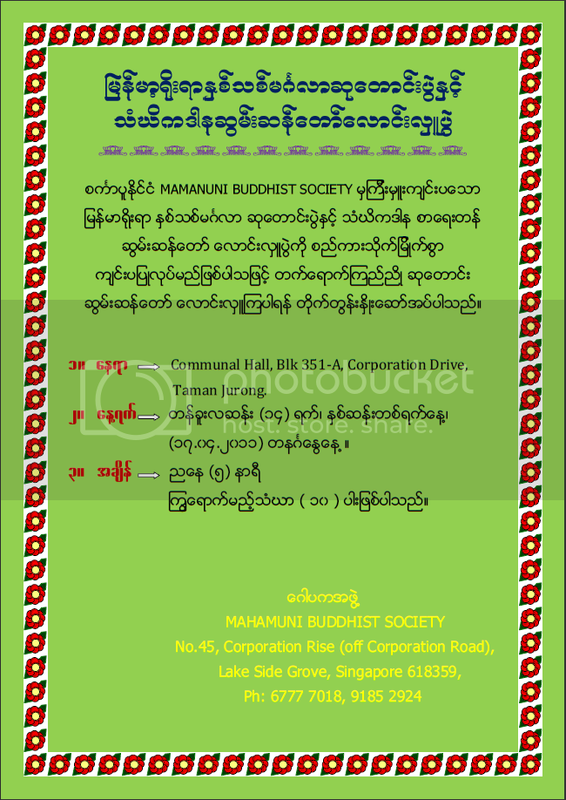 Today, 17th April 2011, there will be New Year Prayers' Celebration in Mahamuni Buddhist Society. The location of the event is Communal Hall, Block 351-A, Corporation Drive, Taman Jurong and the timing is 5:00 pm this evening. Here is the invitation for the event. If you are still eager to celebrate Water Festival of New Year, 2011, there is one more chances for you. That is the New Year Celebration of Thitsa Parami Monastery. It will be happening on 22nd of April, Good Friday. The venue will be Informatics Campus (Outdoor), 12 Science Centre Road (near Jurong East MRT). The timing is 8:00 am in the morning to 5:00 pm in the evening. Below is the invitation for the Informatics Water Festival of Thitsa Parami Monastery. Hope you all get a piece of info and prepared to get involved in those events, and wishing to be able to make good deeds. 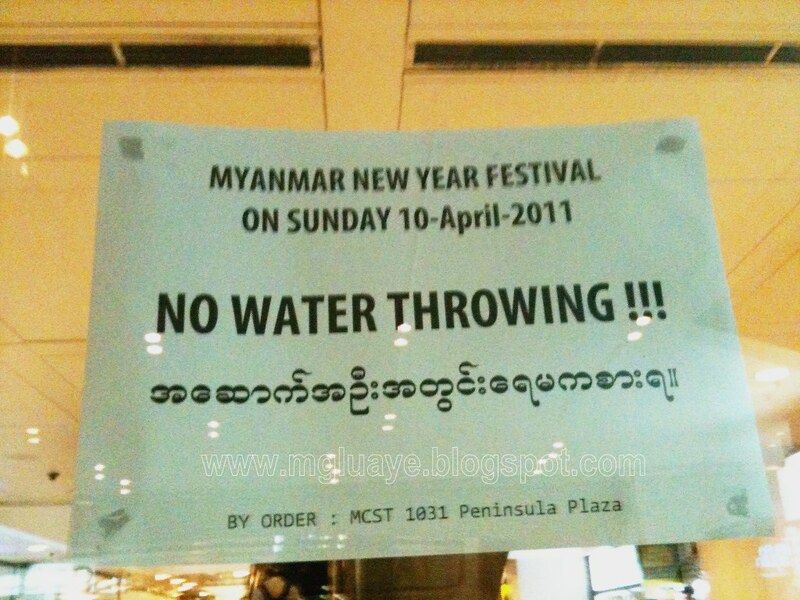 As I had posted on here last year, this year also, splashing water on one another in Peninsula Plaza of Singapore, which is sometime referred as a little Myanmar in Singapore, is prohibited for Myanmar New Year celebration. 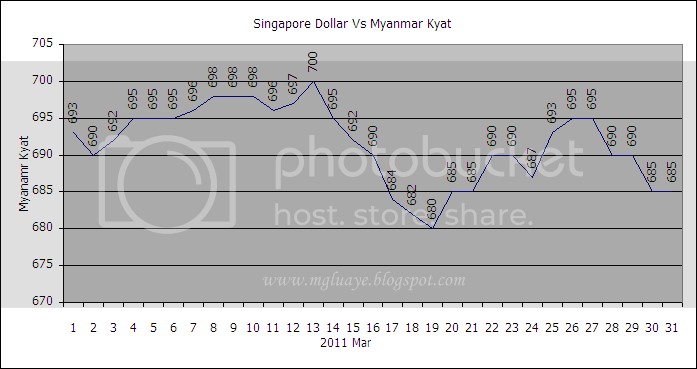 For the month of March 2011, the average exchange rate between SGD and Myanmar Kyat was 691.4839 Ks/SGD (7.5196 up from previous month average rate), highest was 700 Ks/SGD on 13th of March and fell lowest till 680 Ks/ SGD on 19th of March. 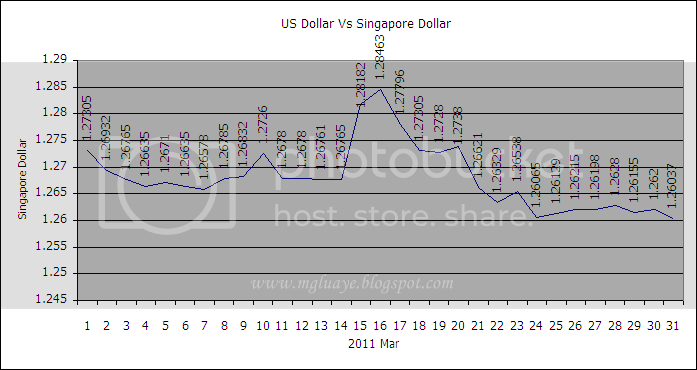 For USD vs SGD, the average rate for the month of March was 1.2680 SGD/USD (0.0080 down from previous month average rate), highest 1.2846 on 16th of March and lowest 1.2604 on 21st of March.